In all my planning to start our planted tank, one thing I was not prepared for was the difficulty in getting the stem plants in place. I was planting a new bunch of Bacopa Caroliniana and it became a comical exercise. I had a bunch of 6 stems that I had separated and was trying to get into place at the back of the aquarium. I would manage to get a few in place, only to have them float to the top with the jostling of my hands in the very tight confines of the Spec V I was planting in. An hour of that became infuriating! I didn’t know at the time, but I was doing many things wrong that made the process much more difficult than it needed to be. I eventually got a few planted. They survived, have multiplied, and I have a tank full of them now. I routinely pull them up to trim and rescape, and along the way I have found a few valuable tips for planting stem plants. My first time planting, my only tools were my fat fingers and a set of plastic play tweezers from a toy set. 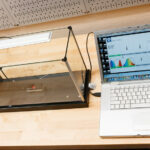 I was convinced that fancy aquarium tools were an extravagance and not needed. 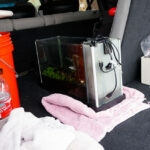 I was highly wrong, especially when trying to plant in the tight confines of a nano aquarium. The tool that would have benefitted me greatly was a set of long planting tweezers, known as pinsettes. 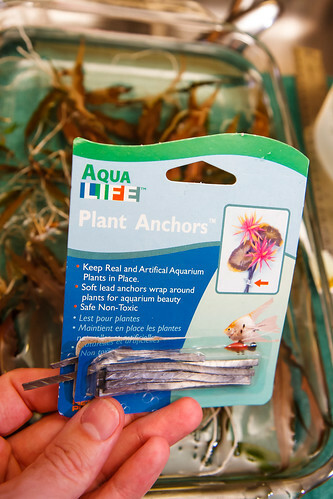 I have since gotten myself a set of these and they are invaluable in setting stem plants down into the substrate. I also learned along the way that some substrates are easier to plant in than others. My first go around was with Seachem Flourite. It is a rock based substrate that is densely packed and heavy. It is difficult to force the delicate plant stems down into this substrate without tearing or breaking the plant. Conversely, during our recent rescape, I replaced the Flourite with a soil based product (Up Aqua Aquasand). Soil based substrates in this family (also like ADA Amazonia) are less dense (lighter, more bouyant) and the slightly larger grains make it much easier to plant. 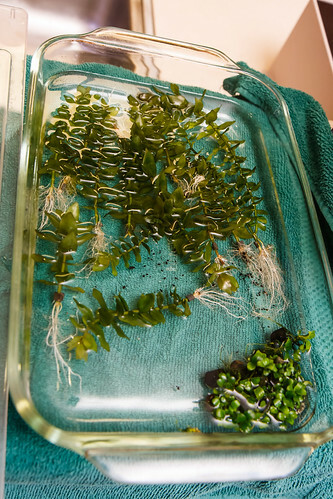 The plant’s stems very easily slid deep down into the substrate (using the pinsettes) without breaking the plant. 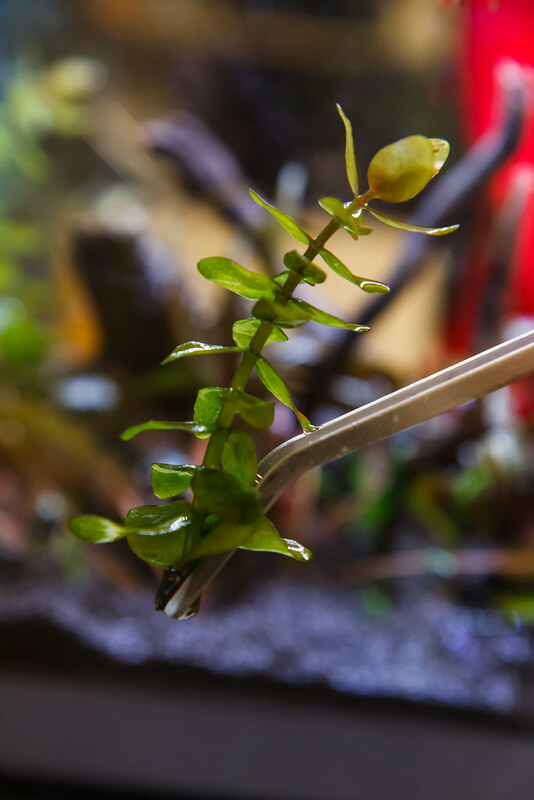 Plant Preparation: If you are rescaping your tank, you may have plants that are taller than you want, and they may have a bundle of thick roots at the bottom. Go ahead and trim the plant from the bottom to remove the roots and get it down to the height you want to plant. Even if the plants are straight from the store, it is good to trim just a bit off the bottom to have a fresh end to place into the substrate. Plan for a plant height to allow 2-4cm below the substrate surface. 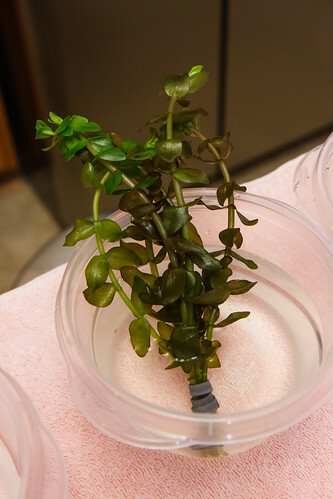 If your stem plant has leaves, like the bacopa caroliniana that I currently have, you may be tempted to strip the leaves from the bottom portion that you are placing in the substrate. I finally realized that it is beneficial to leave these lower leaves in place. They help to hold the plant in place. The leaves that are fully below the sand may ‘melt’ (plant speak for rot and disintegrate) but I don’t see any problem with this. Try grasping the plant at 45 degrees. 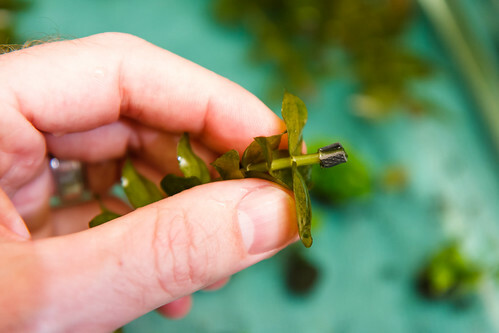 Then lower the plant and bury it to depth, placing 2-4cm below the substrate surface. At this point, you need to get the tool back out and leave the plant in place. Try backing the tool out at an angle (why it is suggested to grasp at 45 degrees to the plant) away from the plant. Once you have the plant in place, wiggle your tool a bit and then continue wiggling it slightly as you release the plant and remove the tool from the substrate. This wiggling motion helps the substrate to fall into the void around the pinsettes and holds the plant down. This is probably not how the professionals do it, but if you still have trouble keeping stem plants from floating up even with proper tools and technique, there is a great solution: lead weights . You are probably familiar with these as they often come wrapped around bunches of plants from the store. Even though it might not be ‘proper’ with world class aquascapers, I use lead weights to hold down my stem plants and I’m not ashamed of it. One little bit of flexible weight wrapped around each stem keeps them solidly in place. 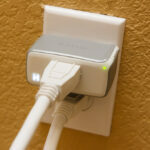 With a bit of technique in how to place them, they are easily removable and can be reused. Plant weights are small, thin, and very flexible; easy to form around stem plants. Your local pet store will probably have something suitable. 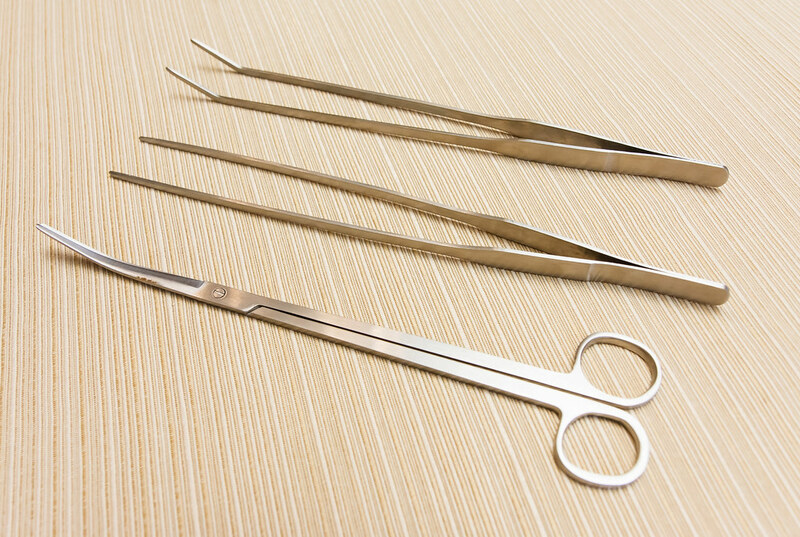 They are easy to cut into pieces with scissors. There are a few tricks to placement. I usually put the weight right at the very bottom of the stem plant. If a set of leaves are left in place at the very bottom end, I put the weight just above that. It’s important to not just squeeze them onto the plant as it will hinge and crush the plant stem. I first bend the weight into a ‘C’ shape around then end of my tweezers. Slip the plant stem into this ‘C’ and ever so slightly squeeze it around the plant. It doesn’t take much force at all to secure it. Once the plant weight is in place, just place it using techniques as I describe above. For my medium light tank, I have to cut the plants down about once every 2 months. I choose to remove all the stem plants and cut off the bottoms (instead of just cutting off the top). 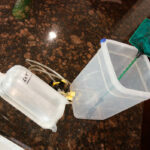 Using the methods here, it is quick work and my plants no longer float up. 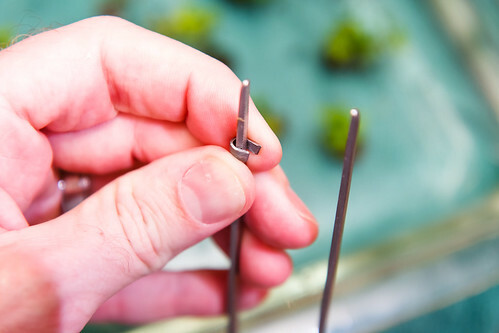 The plant weights are easy to remove; just use a fingernail to open them up, remove, and they are ready to be used again once I trim the plant. I hope these tricks prove to be helpful. 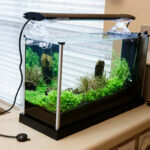 More than anything, keeping a planted aquarium makes you develop skills and knowledge to be successful. You will come up with your own tips and tricks for success in no time. Hang in there and have fun! This entry was posted in Planted Aquariums and tagged aquarium stem plants, aquascaping, bacopa caroliniana, lead weights, pinsette, planted aquarium, planted tank. Bookmark the permalink. Yaaaaaaay this is exactly what I was looking for! Thank you so much! You’re welcome and so glad if it is beneficial to you! Hello. 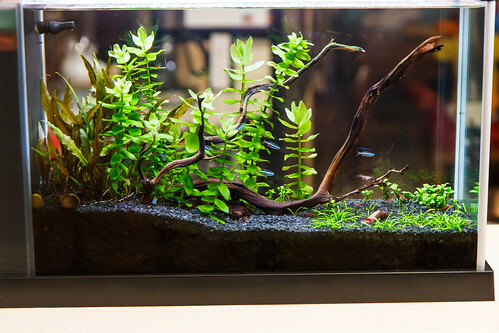 Where can I find all these plants you have in your spec v? Thanks. I got mine here, although you should be able to find these plants at any number of shops or online retailers. This tank currently has: Bacopa Carolina, Cryptocoryne parva, ANUBIAS NANA PETITE, and Cryptocoryne undulate. Is there a way to keep the roots in the substrate? I find most of my plant’s roots tend to come uncovered. I can’t think of anything, other than bury them lower. You might mean roots that grow upwards. 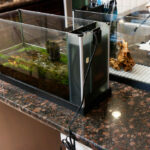 The only think I can think of to help with that is make sure to have a deep enough layer of substrate. Nate, I know this is a few years old, but great write up! This has helped me quite a bit as a new to the planted tank hobby. Now if you could just write up a comprehensive guide abut algae lol. I have many articles I need to write about planted tanks. Hopefully some will come in the new year. Nate: thank you so much for all of this information; it is exactly what I needed to know. I didn’t have luck with my first attempt at stem plants (bacopa caroliniana and ludwigia repens). It seems I was mirroring your mistakes. I just bought some new substrate, new plants, and plant weights. Wish me luck! Also, where can I find your other articles?